Ever since I read the book "The Design of Everyday Things" I notice awkward objects that have not bothered me before. What is wrong with this light switch? OK, I tell you. The problem with this light switch is that the toggle on the left side, closer to the door, should turn on the main light in our master bathroom. It doesn't. That one turns on the light in the shower cabinet and the other on the right side turns on the main light which is totally the opposite the way I'd expect it to work. Whenever I enter the bathroom I have to think about which toggle to use: the one on the left or the other on the right hand side? I asked my 5 year old son this afternoon to grab something from the bathroom. I turned back from my desk and watched what he was going to do. He walked into the bathroom, switched on the toggle closer to the door which turned on the shower light. He noticed that's not what he wanted, quickly turned it off and switched on the other one on the right hand side. This is the point where I paused for a few seconds. A 5 year old's mind is basically working with instincts, he hasn't had much chance to reprogram his brain. 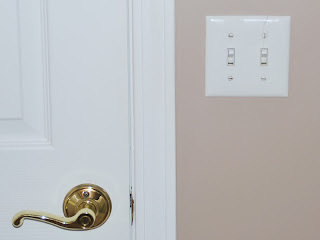 And yet he still used the toggle closer to the door first thinking that is the one for the main light. I wish I could use his help to do user acceptance or API testing. If something is not obvious for a 5 year old then it should be further simplified. Like how Steve Jobs wanted to ask a 4th grader to write a manual for the Macintosh back in 1983.